Southwestern Communications in Decatur, Ala., has spent about 30 years behind bars … installing integrated security systems, access controls, cameras and utility override controls in county jails, state prisons, police stations, juvenile detention facilities and courthouses across the Southeastern U.S. and beyond, including Essex County in the Boston area. The work started when SWC was a subcontractor on a job at state prisons in 1989 and has become one of the headline parts of the business in the past 20 years, with a detention services division created in 1998. Clearly, there is a mission-critical element to this type of work, since if there’s anything wrong with the system SWC installed, it could lead to a prison break or something worse. Division director Rick Holmes knows there’s a lot at stake in every job he oversees but he embraces the challenge that comes with it. A crisis situation on school grounds can come in many forms. From devastating campus gun violence to carbon monoxide leaks that can leave students and staff ill, the outcome of any crisis situation depends largely on how prepared the school is beforehand. Implementing the latest technology solutions, such as classroom audio enhancement, emergency alerts, hearing impaired notifications and wireless clocks into schools nationwide not only provides students and staff with a sense of security, but it can also save lives and minimize the devastation that can result in the wake of a crisis situation. Working with Queen of Angels Catholic School in Roswell, Georgia, prior to the 2015 school year, South Western Communications, a Indiana-based provider of integrated communications solutions for healthcare, educational and commercial clients, installed two new technology solutions: a crisis lockdown alert status system and a communications console, that have enhanced the school’s safety and communications. The crisis lockdown alert status system gives an overview of the school floor plan with a graphical map used to communicate with first responders and emergency personnel to improve response times. The system allows teachers to provide first responders with live updates concerning what’s happening in their classrooms, which then displays on the real-time graphical floor plan map. In the event of an urgent situation, teachers can change the status of the classroom from green for “okay” to red for a more serious issue on a computer screen. That information is instantly accessible to resource officers, school administration and anyone else who should be alerted. If faced with an emergency, the system will initiate a lockdown, activate a pre-recorded message over the PA system and alert first responders, all simultaneously triggered with a single button push. The Queen of Angels Catholic School principal Molly Carlin said the school has a 99-percent check-in rate everyday with the system in order to practice and ensure it’s up and running. The communications console can be utilized for multiple bell schedules, live announcements, emergency tones and pre-recorded instructional messages to direct students and staff in the event of an emergency. It also has the ability to integrate with all communications and access control systems. Having Principal Carlin’s voice initiate a lockdown has been very effective during drills at Queen of Angels Catholic School because a calming, familiar voice keeps students at ease and no longer triggers unwarranted chaos or panic. Utilizing the communications console, the push of a silent panic button now integrates to ensure all doors, including pre-existing fireproof doors, now lock automatically in the event of a school lockdown measure. The school’s new security measures include a door access control system, which requires school personnel to verify visitors before unlocking outside doors for entry. In the event that front office personnel is unable to unlock the door, the call would escalate to two further offices where the staff is able to utilize the access control cameras to visually see the visitor as well as speak with them via the secured entry speaker prior to unlocking the door. The communications console and crisis lockdown alert status system are only two technology solutions that can help schools prepare for a crisis. There are many additional integrations that would make for a fully scaled school safety solution. Security cameras located at all entrances can quickly identify when a visitor is at an entryway and anywhere else on campus.Cameras can integrate with emergency systems to be visible from the alert status system graphical map to zoom into a specific location upon notification of an emergency. Notification lights in the gymnasium and hallwayscan be used as a visual display in the event of weather or other emergency situations, allowing for hearing impaired notifications. Incorporating digital signage allows schools to visually display emergency evacuation procedures on TV screens throughout classrooms and the school. Having microphones in every classroom can distribute teachers’ voices throughout the classroom. This is proven to assist in student learning and performance as well as reduce classroom disturbances. To keep everyone on the same schedule, wireless clocks throughout the school ensure bell scheduling and protocols are synchronized. Panic-call buttons in classrooms and throughout the school is an easy way to have contact with administrators in the event of an emergency or all-clear, check-in situation, where a touchscreen control panel can be used to control all integrated communication and security systems, allowing for a single location to initiate protocols across multiple systems including remote capabilities with iPhone and Android apps. July 2014: While consulting with Trigg County Schools in Cadiz Kentucky, SWC was offered the opportunity to partner with School Officials, State and local First Responders in a yearly Active Shooter Training exercise, which took place July 10-11th, 2014. The event brought together emergency response personnel from the Trigg County Sheriff Department, the Cadiz Police Department, Cadiz EMS, Kentucky State Police, and the Hammond Indiana Police Department. In addition to the professional team of first responders, many school and local individuals participated in the event acting as victims, students, and teachers. The training operation was set to prepare first responders for school emergency situations, specifically an active shooter on campus. This type of training equips response teams with critical knowledge of how to react in a lock-down situation and ensures the most efficient response times possible. 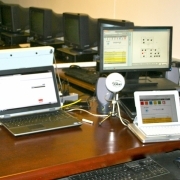 As part of the emergency training, SWC installed the new Rauland Telecenter Campus and Sielox CLASS systems at Trigg County Vocational School where training tookplace. These systems work together to instantly provide vital status updates to first responders, giving them access to real-time information during an emergency. Through utilization of the Sielox CLASS system, first responders are able to view the status of each individual classroom on a cell phone, iPad or other internet connected device prior to entering the building. This provides responders with crucial intelligence of where to focus efforts upon arrival and throughout their response, saving them critical time during an emergency situation. SWC was able to experience first hand the benefits of these new emergency communication systems, received valuable feedback for future system enhancements, and gained the support of first responders and school administrators within the Trigg County community. Thus far, it has been an exciting summer for the SWC education solutions team with our first Sielox CLASS and Telecenter Campus installations in Georgia and Kentucky. We continue to see momentum as we consult with more schools and districts throughout our six state territories. November 8, 2013: SWC received the prestigious Top of the World Distributor Award in front of hundreds of Rauland distributors who gathered at the Harbor Beach Marriott for Rauland’s Global Sales Conference in Ft. Lauderdale, Florida on November 4th- November 6th, 2013. During the award presentation, Maureen Pajerski, Vice President of Sales and Marketing for Rauland-Borg, explained that the award recipient was determined not only for total health care sales, but for exceptional quality and service as displayed by outstanding customer feedback acknowledged on Rauland’s Stellar Partner survey results. Ms. Pajerski explained how one customer requested to be contacted by Rauland for further discussion simply to brag on the SWC team and a job well done. In addition to winning Top of the World distributor, SWC Healthcare Account Executive Tony Hackett was awarded the Top Salesperson of the Year for the Ohio Valley region by Rauland Regional Manager Sean Doherty. This is the third consecutive year an SWC employee has received a regional Salesperson of the Year award. Prior winners include Ivan Cagle, Ohio Valley Region 2011, and Dave Summers, South East Region 2012.